Michel de Nostredame was born in the French town of St. Remy, in the year 1503, the 14th of December, about noon. His father, a notary, was James Nostradamus, a name which is equivalent to de Nôtre Dame (of Our Lady) - some say he was of a noble, others of a Jewish descent. His family, however, had been converted to Christianity, and claimed to be of the tribe of Issachar, which had the gift of prophecy. His mother's was Renée de Saint Remy and her ancestors were skilled in mathematics and medicine. It was his great-grandfather who gave Michel a first taste for the celestial sciences. He was put to school in Avignon and later he went to the university at Montpellier, to study philosophy and the theory of medicine.Montpellier had the most famous school of medicine in all France; it was an ancient school, said to have been founded by Arabian physicians when forced to fly from Spain. Learned and medical as it was in the days of Nostradamus, the city of Montpellier could not escape visitation by a great plague, and Nostradamus had to retreat to Narbonne, Toulouse, and Bordeaux. In these towns he commenced practice; four years later he returned to Montpellier to take his Doctor's degree. On his way back to Toulouse he passed through Agen, a town on the Garonne, where he met with the learned Jules César Scaliger, who became his intimate friend. Scaliger even induced him to take up his permanent residence in the town, but some time later their cordiality grew less and rivalry sprang up between them. In Agen, Nostradamus married a "very honorable" lady, though history has not divulged her name. By her he had two children, who died young; she also died. Finding himself alone again, he returned to Provence. 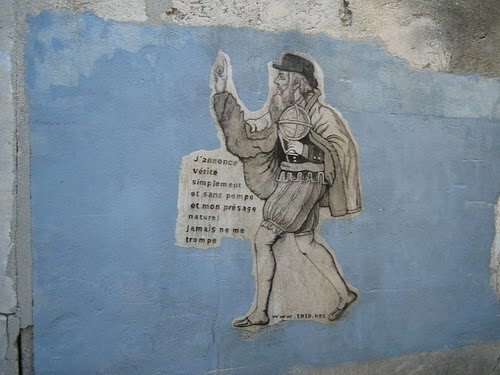 When Nostradamus reached Marseilles, he was invited by the Parliament of Provence to come to Aix, where he stayed three years, receiving a salary from the city from the time the plague broke out. His services must have been recognized as valuable. Nostradamus now went to Salon de Craux, where he married for the second time, with Anna Ponce Genelle. He had three boys and three girls with this lady. It was here that he foresaw great mutations throughout the whole of Europe, and civil wars and troubles that were coming to the kingdom of France. Feeling an unaccountable and new enthusiasm springing up in his mind, amounting at last in a maddening fever, he sat down and wrote his "Centuries" and other "Presages" - the first is dated 1555. Nostradamus kept them by him, afraid to publish them because they would bring him in danger. At last, overcome by a desire to be useful to the public, Nostradamus produced them and no sooner had he done this, than the rumour ran from mouth to mouth, at home and abroad, that something marvellous and admirable had appeared. "One cannot see of what use they could be to the public," Nostradamian Chas A. Ward says in his book Oracles of Nostradamus, "as they could not possibly be understood till they were interpreted after the event and by it. In some of the quatrains he says as much himself. He no doubt published them because he felt an intense longing so to do; and, when the mind of a man reaches this stage of desire, it will not take him long to find some excellent reason for carrying out the impulsion." The prophecies of Nostradamus divided the public. Some called him a visionary, others a fool. He was accused of magic and being in too close treaty with the Devil to be honest. A lot of the really important people of his time thought that he was endowed with a supernatural gift. Amongst these were Henri II and Catherine de Medici. 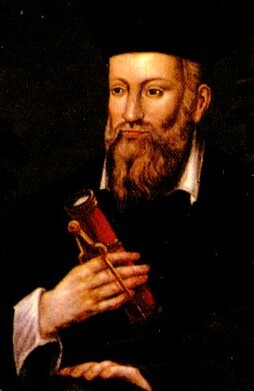 One this is certain, Nostradamus felt much hesitation to publish his prophecies, and when he at last took the step, in 1555, he addressed the book to his infant son and not to any public character. Nostradamus was summoned to the Court at Paris, loaded with honours and consulted on high matters, and he displayed nothing but moderation and good sense. Contentedly he returned to his modest home at Salon de Provence. The repute of Nostradamus grew, and it came to the ears of Queen Catherine de Medici and Henri II that he had published the first seven Centuries of his "Prophecies" (the remaining Centuries, the Sixains, and Presages, were not published till long after). In 1556, they sent for him to attend the Court in Paris. The Lord Constable Montmorency attended him at his inn, and presented him to the king in person. And the king showed him high favour, and ordered him to be lodged at the palace of the Cardinal de Bourbon, during his stay in the capital. His majesty and the queen dispatched him to Blois, to visit their children, give his astrological opinion and cast their horoscopes. It is quite certain that he did not tell them precisely what he thought, for the princes were Francis II, Charles IX, and Henry III, whose tragical fates he had already correctly set out, with unmistakable clearness, by the forecasts in his strange book. Nostradamus returned to Salon and was so much encouraged that he set to work and completed his"Centuries", consisting now of three hundred more quatrains. He seems to have printed these new quatrains in 1558. Nostradamus had now become a court favourite. And then Henry II was killed, in 1559, at the tournament of St. Quentin, was Nostradamus had foreseen in Quatrain 35 in Century I - and we will tell here in a next episode of Life and Works of Nostradamus. In 1555, Thevet sailed the entire coast of North and South America far north as Bacalaos or Codfish Land, as Newfoundland then was called. Upon his return, in 1558, he published in Antwerp an account of his travels, stating that he had set foot on “Isola des Demonias”, and that he had seen how malicious the demons were. He warded them off by repeating the Gospel of Saint John. This “Isle of Demons” could well be Quirpon Island, located in the icy strait between Labrador and Newfoundland, where French sailors would not go ashore without crucifixes in their hands, because the island was inhabited by devils. In September 2009 the Dutch singer-songwriter Corjan de Raaf started a new project: The Book of Love was a pop song inspired by Kathleen McGowan's bestselling novel of the same name. With his song, Corjan de Raaf established a crossover between his career as a recording artist and his work as a Rennes-le-Château and Grail researcher and publicist. 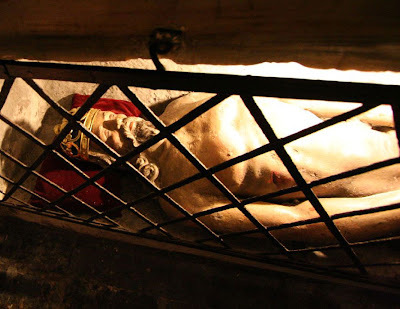 Until now, Corjan was probably best known for his research into the enigma surrounding the French priest Bérenger Saunière who became rich and powerful almost overnight after he had made a mysterious discovery. His RLC Research is one of the most authoritative sites in the field. Corjan writes pop songs with a head, a tail and a story in between. This story now became a "historical mystery"... In October 2009 he wrote a new song, inspired by Hollywood icon Patrice Chaplin and her book City of Secrets, which is the captivating tale her early years spent in the mysterious Spanish town of Girona. Her story follows the intriguing villagers, many of whom belong to a secret society formed to protect the legacy of Abbe Saunière of Rennes-le-Château. And here is a fan based music video (not for profit) of Corjan's song, The Bond Code, inspired by the book of the same name by Philip Gardiner. The music is as always written, performed and produced by Corjan. 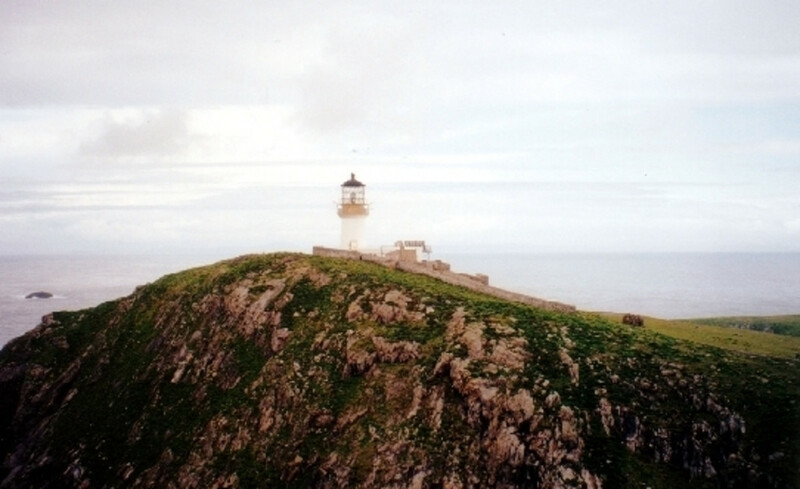 The video was made by Philip Gardiner. And James Bond, 007 is copyright to MGM and EON Productions. Click on the title to read more about the Mystery Singer-Songwriter and his new projects! An archaeological excavation of mass graves of plague victims on the island of Lazzaretto Nuovo near Venice, Italy found the first example ever discovered of a suspected vampire. Although the word 'bikini' has only been in existence since 1946, the two-piece swimsuit that it represents has been around much longer, at least since around 1600 BC. Contrary to popular belief, the science of alchemy was not simply about turning base metals into gold but had various aspects that influenced many areas of our lives. Christopher Columbus is well known for discovering the New World and is seen as a hero of medieval exploration by many scholars today. However, what many text books fail to mention is the fact that he was a genocidal maniac who set in motion what would become probably the worst case of genocide imposed on one nation of human beings by another. The werewolf is a mythical creature that appears in European culture as far back as the times of the ancient Greeks. The culprit was believed to transform into a wolf or a ‘wolf-man', an affliction either brought about by a curse or through the use of magic. Walter Tull was one of the first professional black footballers and the first black officer in the British army. One of Britain’s forgotten heroes, his life story is now coming out of obscurity and he is beginning to gain the recognition he deserves for his contributions to black, football and military history. From the medieval period to the modern, the Samurai sword has evoked fascination amongst warriors and laymen alike and was believed by the Samurai to be joined to his soul. When a child was born to a warrior, a sword was present during delivery and on his death, a Samurai word be buried with his trusted weapon by his side, ready to serve him again in the after life. An area that was formally an island in central Mexico has recently been discovered by archaeologists who believe it was used for ritualistic purposes. The island called Apupato, belonged to the Tarascan Empire, which dominated much of the area from around 1400 AD up to the arrival of the European conquerors in 1520. The largest Anglo-Saxon hoard of gold ever found was discovered in July 2009 by metal detector enthusiast Terry Herbert. The 1,300 year old treasure was discovered in a field near the town of Burntwood in central England and contained over 1,500 scattered gold and silver artefacts. It is generally accepted that pyrotechnology or the manipulation of fire began in Europe around 25,000 years ago, however new evidence has come to light that may suggest it began in South Africa 50,000 years earlier.